As I mentioned on my last post: Surgical options for treating Internal Nasal Valve Obstruction, there are many surgical options and each surgeon has there favorites. Same applies here for Surgical options for treating External Nasal Valve Obstruction. The appropriate surgical treatment offered by a surgeon will depend on what is most likely the cause(s), where your obstruction is located and to what degree. Remember to get few opinions on your condition from surgeons that perform a good number of corrective nasal valve surgeries. I have already posted links on many of the options for correcting external valve collapse on my post titled, Minor Surgical Procedures for treating Nasal Valve Collapse. I will relink them in this post as well. External nasal valve deformity may be a significant source of nasal airway obstruction in some patients. Constantian and Clardy demonstrated that reconstruction of the external valve alone can improve total mean airflow by more than twice that of preoperative valves. Interestingly, this degree of airflow improvement is similar to that observed in patients in whom pure internal nasal valve dysfunction was corrected with dorsal or spreader grafts. Moreover, preliminary data for patients in whom both internal and external valve dysfunction were treated (without septal or turbinate surgery) revealed a mean 3-fold airflow increase, which suggests that the effects of internal and external valve reconstruction may be independent but not strictly additive, presumably because of valve interactions. Static deformity includes tip ptosis and cicatricial stenosis. Tip ptosis, if significant enough, may cause enough narrowing of the vestibule to warrant a tip-lifting maneuver. For structural ptosis, a tip-lifting stitch of 4-0 clear nylon is placed in a horizontal mattress fashion from the dome of the lower lateral cartilage to the periosteum of the nasal bones. For soft tissue ptosis, the thick sebaceous skin at the supratip area along the borders of the nasal subunits can be excised to produce an aesthetically pleasing scar. Tip ptosis is frequently caused by both cartilaginous and soft tissue laxity, as is often observed in the noses of elderly persons (ie, noses affected by aging), and may require a combination of maneuvers. Cicatricial stenosis is another static deformity. Approaches to repair external valve dysfunction secondary to cicatricial stenosis include primary resection, alar interposition, Z-plasty, skin grafts, and composite grafts. Small webs in the external valve area may be divided primarily and then stented. Alar interposition flaps are easily performed but result in increased nasal base width. Dynamic deformity includes (1) flaccid collapse of lower lateral cartilage after over resection during tip-modeling procedures and (2) nasal musculature deficiency. Flaccid collapse of lower lateral cartilage after over resection during tip-modeling procedures can be corrected with the placement of structural grafts into the alar lobule to provide support and to prevent collapse. Over resection of the caudal upper lateral cartilage and cephalic lower lateral cartilage results in dynamic collapse of the internal nasal valve (upper lateral cartilage) and the external nasal valve (lower lateral cartilage) during inspiration. Dynamic nasal valve collapse (both external and internal) is secondary to a structurally weak or deficient lateral nasal wall. The use of alar batten grafts is an effective method for the correction of internal and external nasal valve collapse secondary to flaccid or absent lateral cartilages. The grafts act to reposition and to provide support to the lateral nasal wall to prevent collapse upon inspiration. They are placed into a precise pocket at the point of maximal lateral wall collapse or supraalar pinching, with the use of either an endonasal or an external rhinoplasty approach. Both septal and conchal cartilages are excellent sources of graft materials. Ensure the graft is of sufficient length to be seated in the soft tissue over the bony piriform aperture. However, it does not need to be particularly long in a caudal/cephalic dimension. After the cartilage is harvested, it is carved into a rectangular shape that spans from the piriform aperture to the junction between the middle and lateral third of the lateral crura. In most cases, these grafts are 10-15 mm long and 4-8 mm wide. To provide maximal structural support, the battens are wider laterally toward the piriform aperture. To minimize cosmetic distortion, battens must be thin with beveled edges, especially along the medial aspect of the graft. Notching the lateral border of the graft helps anchor the batten against the piriform aperture. The size and precise placement of these battens depend on the corrections needed for each individual. Larger grafts are used in patients with severe collapse or thicker skin to provide increased support. The primary purpose of batten grafts is to reinforce areas of the sidewall or the alar lobule that collapse because of the negative force associated with inspiration. Battens are not intended to change the resting position of the valve. Preoperative assessment is critical in the determination of the site of collapse. Once it is identified, a soft tissue pocket is created for placement of the graft. This pocket is usually at the level of the supraalar crease at the junction of the upper lateral cartilage and lower lateral cartilage where previous volume reduction may have been performed. The convex surface of the graft is laterally oriented to provide lateral support for the collapsed region of the lateral nasal wall. In most cases, alar batten grafts create fullness at the site of the graft. This convexity tends to decrease with time as edema resolves and scar contracture compresses the graft and shifts it medially. Andre et al described placement of the graft in a sub-alar position, which has improved cosmetic results but failed to improve symptoms in one-third of patients. 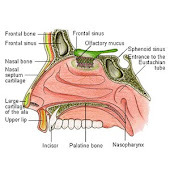 The support and stabilization of the lateral nasal wall increases the internal diameter of the nasal airway, thereby increasing dynamic nasal airflow. The increase in size of the internal airway can be appreciated during intranasal examination, with elimination of alar collapse upon moderate-to-deep inspiration. Alar battens are anchored in place with 4-0 chromic gut through-and-through sutures to tack the batten to the nasal mucosa. Positioning of batten grafts may vary from case to case, depending on whether internal or external nasal valve collapse is being treated. When internal nasal valve collapse is treated, battens are typically placed in a pocket at the site of supraalar collapse and are usually near the caudal margin of the upper lateral cartilage or at the point where the lateral crura may have been previously overexerted. When external nasal valve collapse is treated, the grafts are typically placed into a pocket caudal to the cephalically positioned lateral crura. To maximize effect, grafts must be placed into a precise subcutaneous pocket at the point of maximal lateral wall collapse. A tendency is to place the grafts too far cephalically along the upper lateral cartilage, which may result in persistent fullness of the lateral wall of the nose. If the grafts are placed near the alar lobule, they are better camouflaged by the thicker skin. To correct severe nasal valve collapse, the batten grafts can be extended onto the piriform aperture. Toriumi et al reviewed their experience with alar batten grafts in 46 patients and reported that all but one experienced a dramatic improvement in nasal airway obstruction. Postoperative physical examinations revealed a significant increase in the size of the aperture at the internal or external nasal valve. Palpation of the alar sidewalls revealed increased structural support, and examination of the basal view revealed patency of the external nasal valve upon moderate-to-deep inspiration through the nose. Postoperative fullness in the supraalar region in the area where the graft was applied was minimal. With time, this fullness decreased, which left little evidence of the graft and an overall improvement in the aesthetic result. Toriumi et al conclude that alar batten grafts are effective for long-term correction of internal and external nasal valve collapse in patients who do not have intranasal scarring in the region of the nasal valve, loss of vestibular skin, or excessive narrowing at the piriform aperture. With nasal musculature deficiency, severe cases secondary to facial nerve paralysis are treated with dynamic techniques such as nerve grafts, VII-VII crossover, or XII-VII anastomosis. Use the surgeon's standard preoperative preparation for either external or endonasal rhinoplasty. Obtain preoperative photographs. Surgeons should counsel the patient on possible cosmetic changes. Alar batten grafts can result in effacement of the deep alar creases and widening of the nasal tip. Use the Toriumi method of alar batten graft. The Toriumi method is useful for collapse of external valve secondary to deficiencies of the lower lateral cartilage that lead to collapse. The Toriumi method is not appropriate for absolute narrowing of the piriform aperture or for cases of significant scarring of the valve; however, conchal grafts to the nasal floor or a Z-plasty to release scar may be used in these instances. A.Kalan, F.R.C.S., G.S.Kenyon, M.D. F.R.C.S. Seemungal, M.R.C.P.